Registration for TFL ends 6pm Sunday Night! Registration for TFL ends tomorrow night at 6pm! If you still need a partner please contact Sweegy Manilow. TFL Registration is Now Open! TFL Registration is now open in Alston! Registration is $500 per person and will end Sunday, March 15th. Feel free to take a copy of the TFL info board next to the registration vendor, it will update with TFL scores and news weekly! Also new this year is a 500 Epic Bait and 50 Super Bait participation drawing for non-playoff teams that complete all of their matches. Team Fishing League Season 9 reg opens Tuesday, February 24! It's time for another season of Team Fishing League! Registration will open next Tuesday! If you are interested in sponsoring the league, please contact Sweegy Manilow. TFL Season 8 Complete! Congrats to Mundo Mutsen! 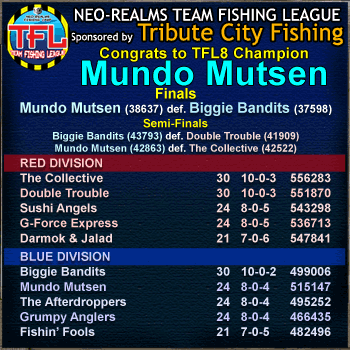 Congrats to TFL Season 8 Winners, Mundo Mutsen! Special thanks to our league sponsor this season, Tribute City Fishing! Thanks to all players who participated, we hope everyone had fun and we will see you next season! 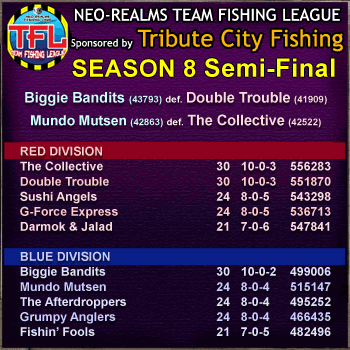 It looks like it will be an all Blue Division Final as the Biggie Bandits defeat Double Trouble, and Mundo Mutsen barely scrape by The Collective by only 341 points! The finals are a rematch of Season 7's semi-final, so it will be a good match! Good luck to both teams!